The scalable Oregon map on this page shows the state's major roads and highways as well as its counties and cities, including Salem, the capital city, and Portland, the most populous city. To display the map in full-screen mode, click or touch the full screen button. To zoom in on the Oregon state road map, click or touch the plus (+) button; to zoom out, click or touch the minus (-) button. To scroll or pan the zoomed-in map, either (1) use the scroll bars or (2) simply swipe or drag the map in any direction. (The scrolling or panning method you use will depend on your device and browser capabilities.) At any time, you can display the entire Oregon road map in a new window or print this page, including the visible portion of the map. Oregon's Interstate Highways connect its major cities and facilitate travel between Oregon and its neighbors. I-5 traverses western Oregon from north to south. I-84 follows the Columbia River from Portland eastward, turning southeastward as it approaches Idaho. In northern Oregon, I-82 splits off I-84 toward the Washington border. Oregon's auxiliary Interstate Highways serve the cities of Eugene and Portland. I-105 provides access to downtown Eugene from I-5. I-405 provides access to downtown Portland from I-5, while I-205 loops around southeastern Portland, providing access to Portland International Airport before crossing the Columbia River into Washington State. The Oregon Coast Highway runs north from Brookings to Astoria, and its rocky and breathtaking scenery makes for a road trip that is not soon forgotten. Cape Blanco State Park, occupying 1,900 acres overlooking the Pacific, is home to a lighthouse and three-mile trail leading down to a black sand beach. North of Florence, the Sea Lion Caves offer visitors the chance to take an elevator down to an observation window to view the animals up close, while the Oregon Coast Aquarium displays tide pools, wetlands, and other marine habitats. Offshore islands, beaches, sea caves, and natural rock arches abound along the remote Pacific coastline between Brookings and Gold Beach. 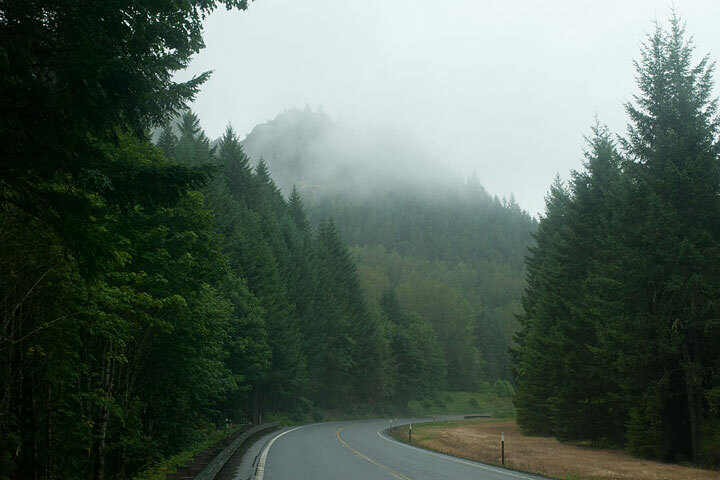 More information about scenic roads in Oregon is available on this Oregon Scenic Byways page. For more information about Oregon's roads and transportation infrastructure, visit the Oregon Department of Transportation website. For Oregon road traffic conditions, visit the Federal Highway Administration's Oregon Traffic Information page. Oregon-Map.org is a State Maps reference source.